The last few weeks have been FILLED with Kreativität. liking, sharing or commenting on content found here at http://www.blog.actionhouse.org. So about a week after I made that announcement, we had a rather cool event at Action House, which was called SOFA No. 1, meaning SOund and FAshion. We hosted a live band, and then had a catwalk runway show. The night was quite enjoyable, and if you’re like me then you’re already looking forward to SOFA No. 2 and other such Kultur in Action House. 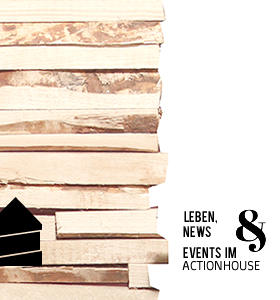 So a week after SOFA, Action House gave a presentation in Mannheim about what Action House is about, what we do and so forth. It was an event which we had been preparing for since the summer, so it was quite a big deal, and we were relieved when it was over. The following week, we met with Frank Zumbruch, who has been a personal hero of mine for a while now, so getting the opportunity to sit down and chat with him in person was an experience I valued highly. He contacted us on Facebook and we set up an appointment for him to come check out Action House, find out a bit about who we are, what we do, where we do it, and why, and we also got to hear firsthand about his experiences and lukewarm reception by some city leaders, as well as some of the projects he has planned for the term of his appointment as the Beauftragter für Kultur und Kreativwirtschaft. We’ve also met with the guys from Subkultureller Fortschritt and I look forward to having them come by and check out our space as well. Additionally, we’ve met with the Jugendgemeinderat of Heidelberg, who intend on running an organization like Action House although on a much larger scale. On top of all that, we’ve been doing a lot of networking, both offline and online, making connections with like-minded groups and individuals, updating the information on our facebook page, and trying to redesign our home page. So basically, the point of this post is to let you know how busy we’ve been, to let you know in case you were unaware that MANY things are happening, and that we’re sorry it’s taken us so long to keep you updated here on the blog. Keep your eyes out for more coolness to come in the next few days.